On January 27, 2017 Advocates for the West finalized a settlement agreement with the U.S. Forest Service restricting mega-load shipments on U.S. Highway 12 to protect the Lochsa and Middle Fork Clearwater Wild and Scenic Rivers. The settlement resolves a 2013 federal court lawsuit that we filed for Idaho Rivers United, along with the Nez Perce Tribe. On September 20th, 2013, the US Forest Service appealed the Court’s decision. We filed a response to the defendant’s motion for reconsideration on Wednesday, October 2nd and the Court again held its decision that the Forest Service must issue a Closure Order. This prompted defendant-intervenor RCCI to file a brief in the 9th Circuit Court of Appeals asking that Judge Winmill’s October 10th decision to deny RCCI’s District Court appeal and keep the Forest Service’s Closure Order in place be overturned. In response, AW filed an opposition to the request on October 21st. In February of 2013, US Chief District Judge Winmill ruled in our favor on a case in which we represented Idaho Rivers United (IRU) against the US Forest Service for their refusal to keep megaloads off Highway 12. The ruling states that, contrary to the USFS’s claims, they do in fact have authority to limit and restrict how the Wild and Scenic River corridor is used based on the Wild and Scenic Rivers Act of 1968. Now, with Highway 12 facing up to 9 new megaloads of oil refinery equipment headed to the Alberta tar sands in Canada, the USFS has stopped short of their duty to protect Highway 12. Nez Perce-Clearwater Forest Supervisor Rick Brazell sent several letters to the Idaho Transportation Department asking them not to issue a permit for the first planned Omega Morgan load, but ITD chose to ignore those warnings and issued the permit anyway. 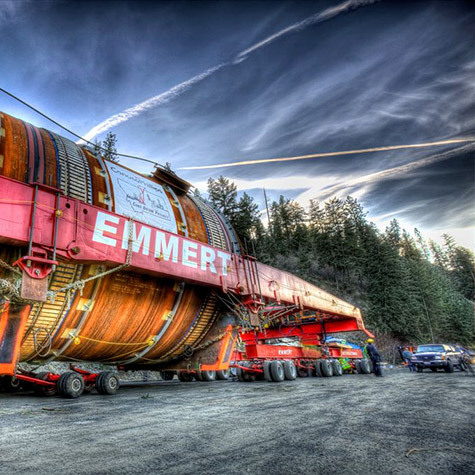 On the night of August 6th, a 255 foot-long, 23 foot-high megaload began its multi-day journey up Highway 12, despite public outcry and protests from concerned citizens. In response, the USFS did nothing. This latest suit against the USFS is a direct result of their unwillingness to act on behalf of the Wild and Scenic River corridor and follow through on their court ordered duty to prevent ITD from issuing megaload permits for Highway 12. We are again representing Idaho Rivers United and will be bringing this case to federal court alongside the Nez Perce Tribe. On August 8th, Advocates for the West filed a complaint on behalf of IRU in cooperation with the Nez Perce Tribe. On the 10th we filed a preliminary injunction motion calling for the immediate action of the USFS to step in and demand the halt of all megaload transports until they have completed a new impact study for the corridor. On September 9th, Advocates for the West and the Nez Perce Tribe appeared in court for a hearing on the case, and on September 13th we received the Court’s decision, which granted our motion for preliminary injunction and further ordered that the Forest Service issue a closure order to Omega Morgan until a corridor review is conducted and the Nez Perce Tribe has been consulted.